Back to basic and natural skincare goodness. 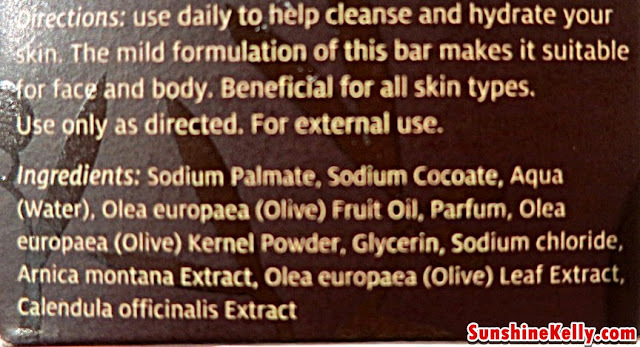 Last time before foam, gel, water, oil etc etc etc cleanser was introduced. We just use soap to cleanse our face and body. Do you use soap? Actually I rarely use soap because I have this perception that soap could be drying for my skin. Well, not until I tried tebe exfoliating Soap Bar. Tebe product contains olive leaf extract which is rich in Oleuropein a natural antioxidant extremely beneficial for our skin because it has powerful antibacterial, antiviral and antifungal properties. Besides, tebe skincare range contains extra virgin olive oil an antioxidant rich in vitamins and minerals which has been used as a beauty secret in the Mediterranean for centuries. This product is made in New Zealand. The size of the soap bar is just right for my palm size. I can grip firmly and use it to glide or scrub my body. The scent is very mild, natural soap and olive scent. There are tiny little rough particles on the soap that acts a body scrub. Tebe Exfoliating Soap Bar it helps to gently exfoliate or remove the dull and lifeless skin away. This triple milled pH balanced blend of ultra-fine olive pips, olive left extract, extra virgin olive oil and natural waxes will help to keep our skin moisturized and refreshed. This soap is suitable for all skin type and for face and body. As for face I use it alternate day. Lather the soap with a little bit of water, then apply on the face, gently massage to exfoliate the dead skin cell especially the nose area. Then cleanse it with water and followed by the rest of skincare regime. Well if I am out the whole day often, then my face will be more oily and dull or slightly darker than usual. 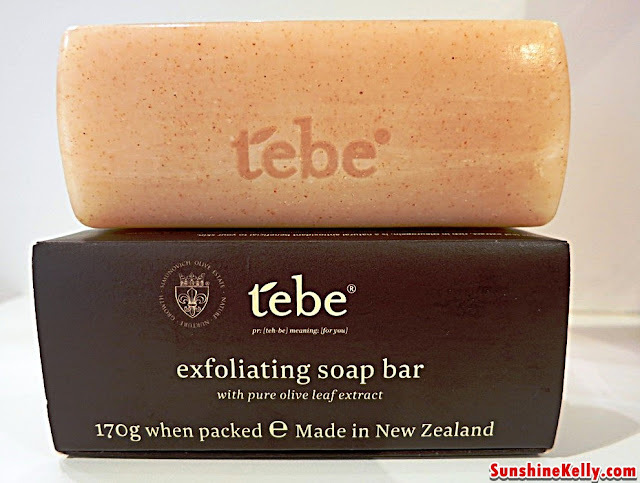 So tebe Exfoliating Soap Bar comes in very handy, it helps to cleanse away the impurities, dead skin cell and dull skin. I use the tebe Exfoliating Soap Bar as my body cleanser and scrub everyday morning and in the evening. The soap bar quite lasting and it doesn’t melt easily. After shower my skin feels really clean, smooth and fresh. The tiny scrub or pH balanced blend of ultra-fine olive pops scrub away impurities and smoothen the rough edge on my ankle and elbow. 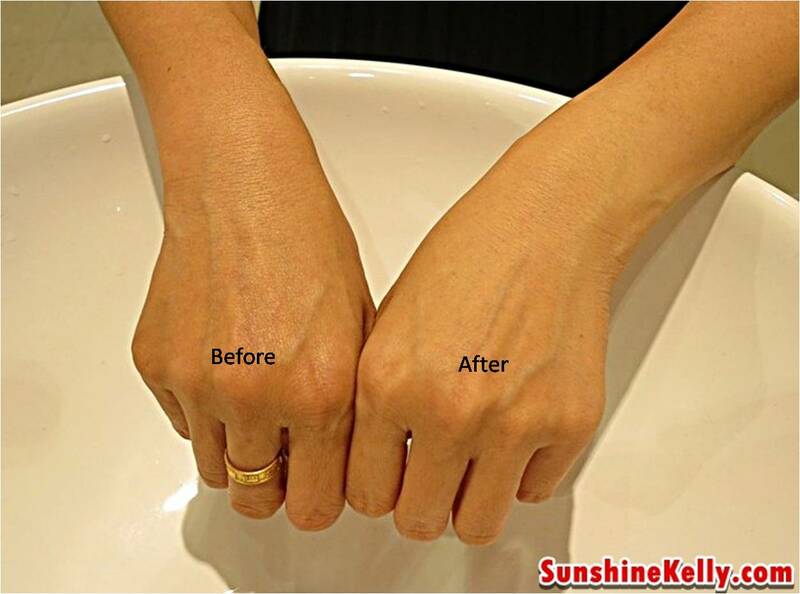 Overall, tebe Exfolianting Soap Bar acted as a gentle scrub for my face and body without drying my skin. After using it for more than two weeks, I can see my skin smoother and more radiant because of the the exfoliating and moisturizing effect. Thanks to the goodness of Extra Virgin Olive Oil and Olive Leaf Extract. Gently removing dull, lifeless skin, this triple milled, pH balanced blend of ultra-fine olive pips, olive leaf extract, extra virgin olive oil and natural waxes will help to keep your skin moisturized and refreshed. It also help to stimulate our skin's natural surface. Suitable for all skin types. For external uses only. Free from mineral oil, parabens, artificial colourants, silicones and animal products. Usage: Use daily to help cleanse and hydrate your skin. The mild formulation of this bar makes it suitable for face and body. For external use.